"The Sacred Heart is a devotional name used by some Roman Catholics to refer to the physical heart of Jesus Christ as a symbol of Divine love. 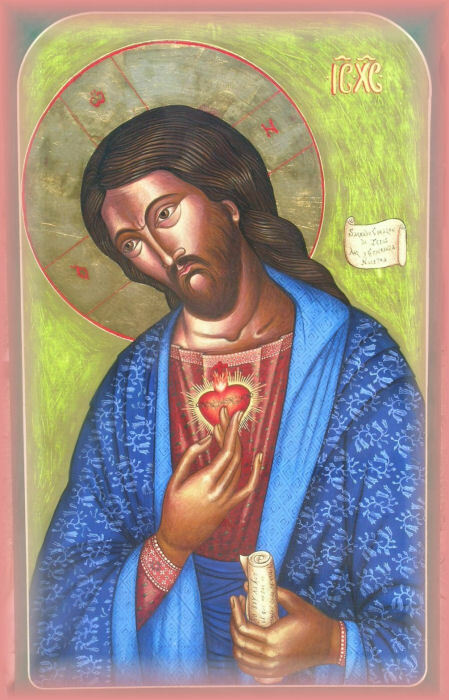 Devotion to the Sacred Heart in focusing on Christ's heart metaphorically focuses on the emotional and moral life of Jesus and especially His love for humanity. It also stresses the central Christian concept of loving and adoring Jesus. In most depictions, Christ's heart is shown containing wounds to which Christ points, as well as a crown of thorns...This wounded heart is meant to symbolize Christ's pain at the rejection of God's Gospel message of salvation and righteousness by humanity. In including the crown of thorns, it alludes to the manner of Christ's death, which is further highlighted by the inclusion of crucifixion wounds on Christ's hands, in most images. Thus the Christ of the image is of a post-resurrection Jesus speaking to humanity, not the pre-crucifixion Jesus of the Gospels."